Our next meeting will take place on April 17th, 2019 at 6 pm at the Continental Arena in Regensburg. 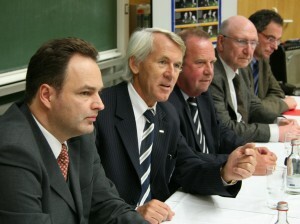 We are very proud to welcome celebrities of German professional football for this special meeting. We may welcome Bundesliga coach and teacher Michael Köllner (former coach of 1. FC Nurnberg) and FIFA referee Dr. Felix Brych, who will both demonstrate “perspectives of the modern professional football“. Further topics will be the fostering of talents but also the discussion of football-associated medical risks of professionals. We will also introduce our new head director of the trauma surgery department of the university medical centre Regensburg, Prof. Dr. Dr. Volker Alt, successor of Prof. Dr. Michael Nerlich. To complete the meeting, our new coordinator of the FIFA Medical Centre Regensburg, Dr. Johannes Weber, gives an account of our current studies and science projects. We are very looking forward to welcome all of you. Prof. Michael Nerlich and PD Dr. Werner Krutsch welcomed about 50 Keyplayers of the FIFA Medical Centre Regensburg (FMCR) to the 23rd Keyplayer Meeting on April 25th 2018. First speaker was Dr. med. Tobias Heising from Osnabrück, head of the most popular students football event in Europe, the ‘Medimeisterschaften’. He presented the idea behind the Meimeisterschaften, which includes over 22.000 participants, mainly medical students, every year. Dr. Heising informed the audience how difficult it can be to organize such a big football event and that a well-structured medical service like prevention or emergency management represents the key for a successful event. 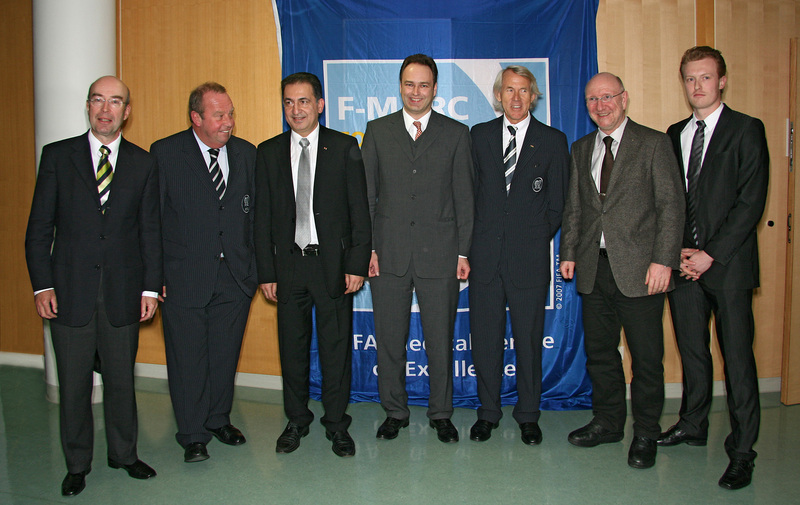 The Medimeisterschaften are the latest prevention partner of the FIFA Medical Centre Regensburg and the cooperation includes mainly prevention in amateur football settings. 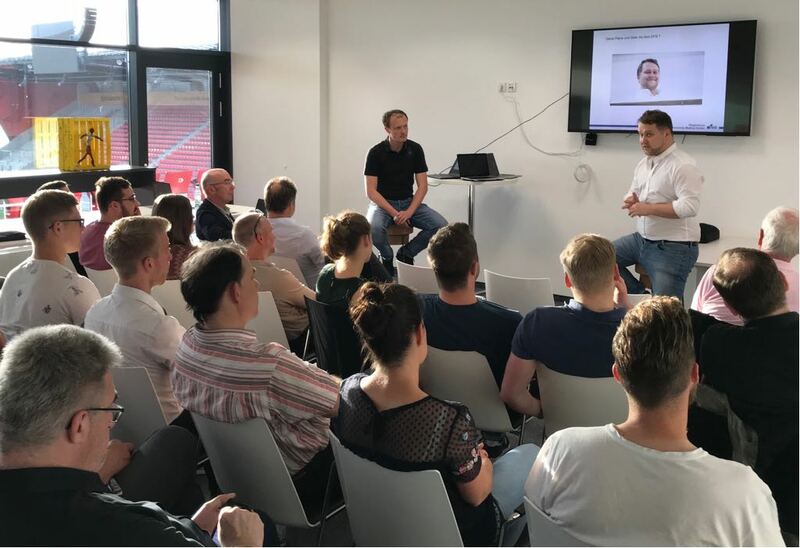 As the major topic of this Keyplayer Meeting was ‘nutrition in sports’, Dr. Frank Möckel, president of the sports medicine physicians in Bayern, presented his experiences as head of the institute for prevention and sports medicine IPS in Regensburg. Dr. Möckel informed about the current recommendations in n utrition in amateur sports, especially before and after competitions. The FMCR was also pleased to welcome Anton Schmaus (in front, right), new head chef of the DFB German national football team. Dr. med. 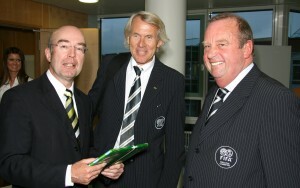 Werner Krutsch (in front, left) took the opportunity to interview Anton Schmaus from the Regensburgs restaurant ‘Storstad’ and asked him about his new role in the DFB, his aims for the upcoming FIFA World Football Championship in Russia and the priniciples and strategies to optimize the nutrition of professional football players. 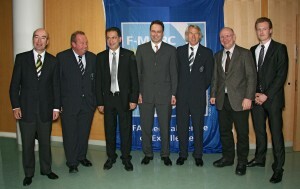 As general conclusion from the discussion with all key players of the FMCR can be resumed that the nutrition as factor for success in football is less-based on scientific evidence, but it is a susceptible key factor for all football players in different skill levels to provide a sufficient preparation for training and competitions and to achieve a well-being to improve the own performance. …and Regensburg is all in! Following the strategy implemented with the first opening of the FIFA Medical Centre of Excellence at the Schulthess clinic in Zurich in May 2005, the world governing body of football has proceeded to set up a network of FIFA Medical Centres of Excellence worldwide to ensure that players have access to high quality football medicine. Until now, ten football medicine centres have received the official accreditation after careful evaluation of their application by the FIFA Sports Medical Committee. 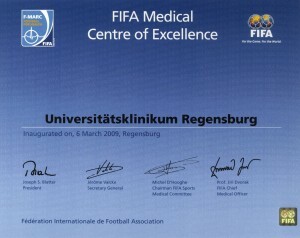 On March, 6 2009, Dr Michel D’Hooghe, Chairman of the FIFA Medical Committee and President of the FIFA Medical Assessment and Research Centre (F-MARC), officially presented Prof. Michael Nerlich and Prof. Peter Angele with the accreditation certificate for the University Medical Centre Regensburg, Germany. 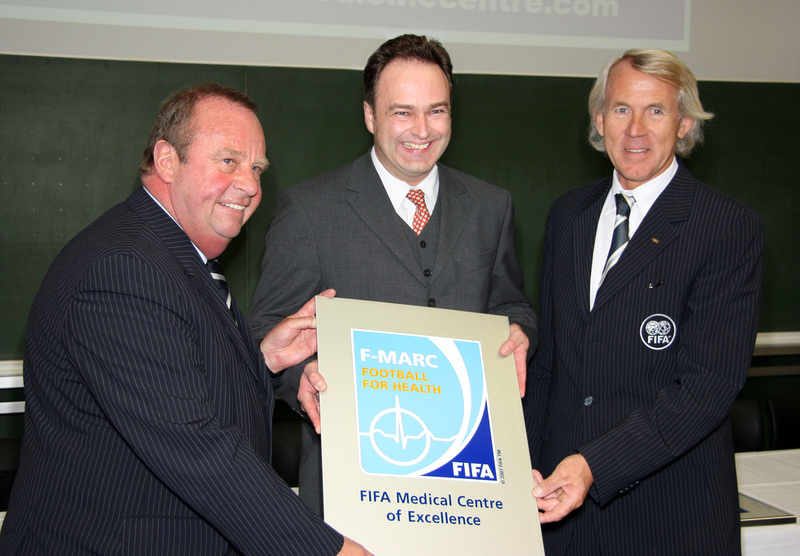 “We are proud to become a part of the FIFA Medical Network!” said Prof. Peter Angele, Director of the FIFA Medical Centre Regensburg. 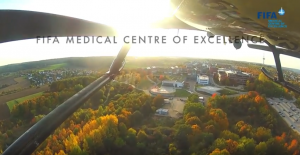 The vision behind creating a network of medical centres across the world is to ensure that players on all continents know who to turn to for expert care in football medicine, such as the prevention of injuries, early detection of risk factors for sudden cardiac death, as well as state-of-the-art diagnosis and therapy services. 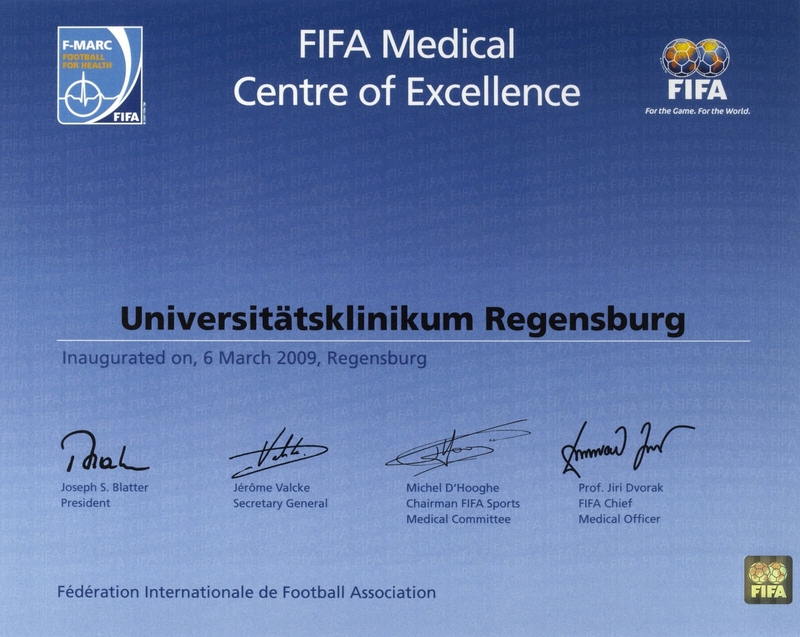 The profile of the University Medical Centre Regensburg is characterized by modern management of football injuries, distinct basic and applied research and knowledge transfer to the football family. Together with a unique blend of partners, the University Medical Centre Regensburg is able to provide players with highest standards of regenerative joint therapy, embedded in a complete service package “from prehab to rehab”. The University Football Medicine Centre Regensburg is in the (German) news! The Mittelbayerische Zeitung publishes the backgrounds of the Fifa Medical Centre in and around Regensburg, talks about the inauguration event on 6. March 2009 and describes the objectives for the future. “We are proud to become a part of the FIFA Medical Network!“, Prof. Dr. Peter Angele, the designated director of the Football Medicine Centre Regensburg told the press. “The objectives are clearly Medical Care, Research and Training in and around football.” he described his future plans.